4Easysoft AVI to AMV Converter is an easy-to-use and high quality AVI to AMV Converter, with which you can freely convert AVI to AMV with super fast speed. Also you can use this AVI to AMV Converter to extract audio from AVI to MP3, WAV, etc. To help you get the perfect output video, 4Easysoft AVI to AMV Converter offers you various video editing features, such as trimming, cropping, merging, adjusting video effect and adding watermark. Convert AVI and audio to MP3, WAV, etc. 4Easysoft AVI to AMV Converter can convert AVI to AMV for you to enjoy AMV movies on your player. You can also use this software to extract audio MP3, WAV, etc. from AVI and other video formats. 4Easysoft AVI to AMV Converter allows you to set video encoder, Bitrate, resolution, frame rate and audio sample rate, channels, encoder, Bitrate and saved all of them for later use. With this AVI to AMV Converter, you can adjust video brightness, contrast and saturation to optimize the output video effect. This Converter AVI to AMV provides the function of clipping a segment video and cutting off the black regions from the from source video. You can add text or imagine watermarks wherever you want to the video. You are allowed to adjust text font size, color, image position, transparence, etc. of watermark. You are allowed to select your preferred audio track and subtitle for the output file. 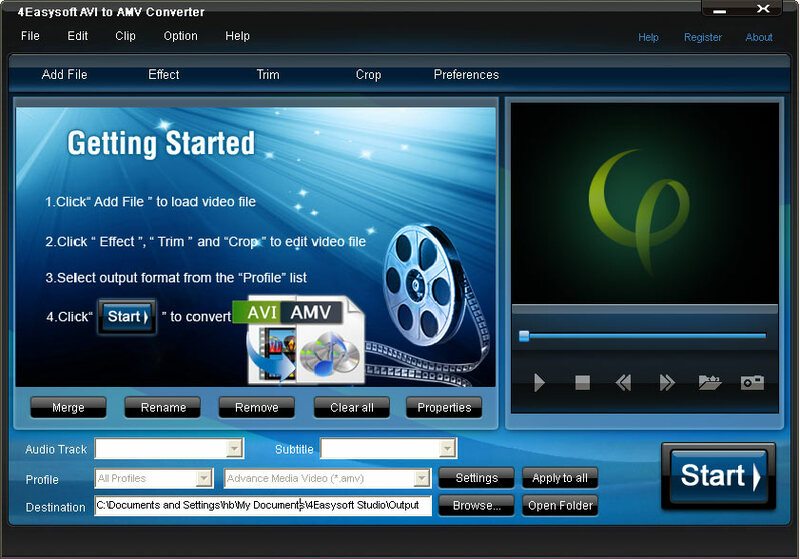 This AVI to AMV Converter supports previewing source and output video. When you find an attractive picture in a movie during the process of converting or editing videos, this software can help to snapshot the image and save it as a JPEG, GIF or BMP file. 4Easysoft AVI to AMV Converter can complete the AVI to AMV converting task in a short time with super fast speed as well as high quality. It is available for you to add watermark on video. Provide subtitle and audio track selection.